A Phantom Marriage Feast-Royal Spirit Present. A telegram from San Francisco, December 13, says: Many curious cabinet tricks of spiritualists have been exposed from time to time, but probably the most remarkable seance on record is that in which a ghostly marriage and a phantom wedding-feast took place under Elsie Reynolds. She was determined to excel all the other mediums in the world, and do something in the spiritual line that had never been attempted before. Elsie Reynolds is a materializing medium. Several years ago she converted to the spiritualist ideas Mrs. Eunice S. Sleeper, an aged and wealthy widow. Mrs. Sleeper’s only daughter died in 1877. She has a handsome residence on Fremont street, this city, and of late has become, under the tuition of Elsie Reynolds, a perfect monomaniac on spiritualism. Mrs. Sleeper took the spiritualistic Elsie to her heart and home, and fitted up a suite of apartments especially for seances and ghostly visitors. Mrs. Sleeper, during these seances, used to derive great consolation in communicating with her deceased husband and daughter, whose spirits were summoned and occasionally materialized. The climax was capped the other evening by the spiritual marriage of the deceased Miss Sleeper to the defunct Prince Otto, of Germany, a relative of Premier Bismarck. The wedding was held in the room of the medium described above, and was witnessed by a mixed company of mortals and spirits. When the lights had been lowered, the curtains of the cabinet were drawn and the materialized bride and groom appeared. A ‘diamond’ crown adorned the head of the bride and her form was completely enveloped by a long white veil. The groom was dressed in garments of the ancient pattern, comprising knee-britches, stockings and slippers, and his head was encircled by glittering jewels in conformity to his rank. The officiating priest was clad in black and wore on his head a white turban. His face was ghastly and his eyes gleamed with an unnatural luster. On the conclusion of the ceremony he gave the couple his blessing and faded away. The bride was attended by two bridesmaids, and asked her mother when they appeared, ‘do we not look like the three graces, Agalia, Euphrosyne, and Thalia?’ The queen mother of the groom and Empress Josephine of France were among the distinguished spirit guests, while Dr. Adams, P.H. Jackson, James Platte, George W. Brooks, Mr. and Mrs. Wm. Day, Mrs. Leonard, and many others were present in the flesh. A bridal supper succeeded the wedding. 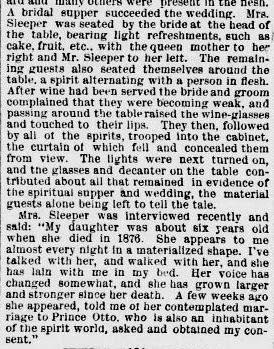 Mrs. Sleeper was seated by the bride at the head of the table, bearing light refreshments, such as cake, fruit, etc. with the queen mother to her right and Mr. Sleeper to her left. The remaining guests also seated themselves around the table, a spirit alternating with a person in the flesh. After wine had been served the bride and groom complained that they were becoming weak, and passing around the table raised the wine-glasses and touched to their lips. They then, followed by all of the spirits, trooped into the cabinet, the curtain of which fell and concealed them from view. The lights were next turned on, and the glasses and decanter on the table contributed about all that remained in evidence of the spiritual supper and wedding, the material guests being left alone to tell the tale. Regardless of what I think about spiritualism or Elsie Reynolds’ reputation for being a fraud, I’ve gotta admit that this is a pretty great story.